I’m not sure if Norquist understands this or not, but in the current moment of institutional weakness for American liberalism, he’s the most powerful advocate we have. At the end of the day, the long-term level of taxation is determined by the level of money that’s spent. Every dollar the federal government spends will be repaid, with interest, out of taxes. And currently in Washington we have lots and lots of Democrats—from Barack Obama to Senators Mark Udall and Michael Bennet—arguing for reductions in scheduled spending. And the main thing standing in their way is Grover Norquist, his tax pledge, and his insistence that no Republican vote for any spending cutting bill that also includes some increases in revenue. So far, that’s denying cuts-oriented Democrats the working legislative majority they need to implement their agenda, and giving congress’ small number of hard-core progressives the ability to veto cuts in Social Security. It's clearly true. The size of government is defined by the size of spending, not taxes. Any money that's spent will eventually be matched by taxing, whereas tax revenue does not create its own spending. A deal that increases taxes and cuts spending is a deal to reduce the size of government. 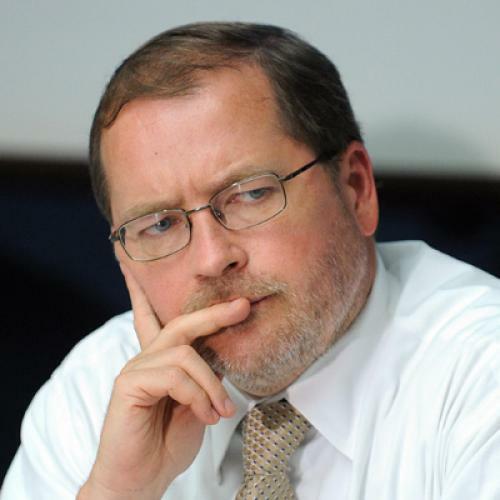 It's amazing that so many conservatives, led by Norquist, oppose a deal like that. There are, however, two flaws in the Norquist plan. The first is that it depends upon Democrats playing the sucker forever, using their presidencies to clean up the GOP's mess, then watch Republicans make a mess all over again, and be willing to use their power to play janitor this way in perpetuity. There's also the fact that Norquist's plan runs the risk of undermining the entire fiscal basis of the federal government and precipitating a collapse, but I'm not counting that because I'm not sure Norquist considers it a flaw.